Jesus Christ did important work at special places in the days before He was crucified and resurrected. 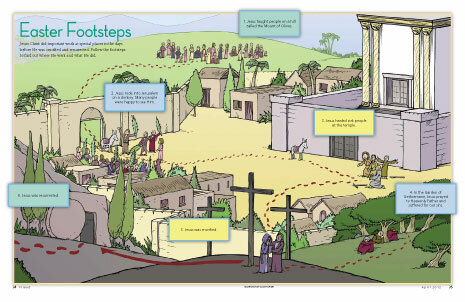 Follow the footsteps to find out where He went and what He did. 1. Jesus taught people on a hill called the Mount of Olives. 2. Jesus rode into Jerusalem on a donkey. Many people were happy to see Him. 3. Jesus healed sick people at the temple. 4. In the Garden of Gethsemane, Jesus prayed to Heavenly Father and suffered for our sins.